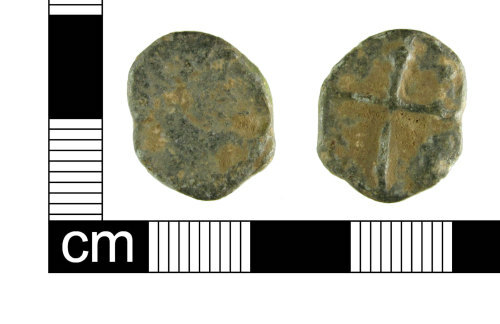 A Post Medieval C16-18th, lead-alloy uniface token. Type Powell 14b with a cross or Paul Baylis type 2 - linear cross with pellets. It is probable that the pellets within the quarters of the cross are meant to simulate the Medieval penny. The item has a worn condition, a with a silver surface. This is likely to date between 1500-1799. Powell, D. Leaden Tokens Telegraph Newsletter. Issue Sixteen.